Thousands temporarily force road closure to express outrage over deadly US drone strikes they say violate sovereignty. Thousands of people protesting US drone strikes have blocked a road in northwest Pakistan that is used to transport NATO troop supplies and equipment in and out of Afghanistan. We will put pressure on America and our protest will continue if drone attacks are not stopped. Imran Khan, a Pakistani politician and former cricket star, led the protest in the Khyber Pakhtunkhwa province that his Tehreek-e-Insaf party governs, and called on federal officials to take a firmer stance to force the US to end deadly drone attacks and block NATO supplies across the country. “We will put pressure on America, and our protest will continue if drone attacks are not stopped,” Khan told the protesters, who dispersed after his speech. The US Embassy in Islamabad declined to comment on the protest that closed a route leading to one of two border crossings used to send supplies overland from Pakistan to neighbouring Afghanistan where the US leads the coalition of NATO troops battling the Taliban in Afghanistan. The protest was likely to have more symbolic value than practical impact, because there is normally little NATO supply traffic on the road on Saturdays. Drone strikes have been a growing source of friction between Islamabad and Washington. 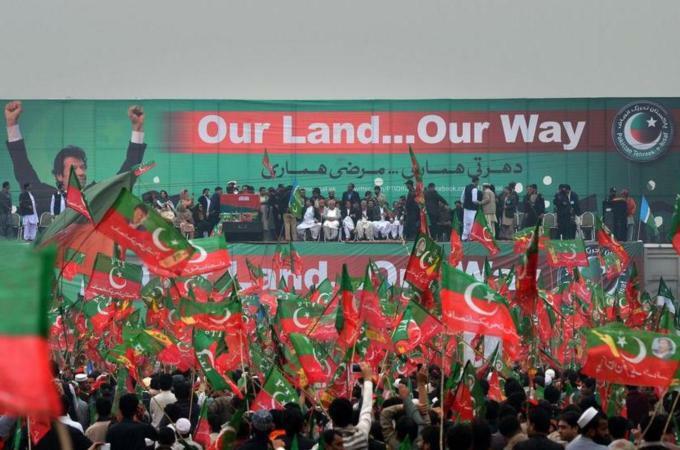 Khan and other officials regularly denounce the attacks as a violation of Pakistan’s sovereignty, although the country’s government is known to have supported some of the strikes in the past. The protest came only two days after a rare US drone strike outside of Pakistan’s remote tribal region killed five people, including at least three Afghan fighters, at an Islamic seminary in Khyber Pakhtunkhwa. The attack outraged Pakistani officials, as did one on November 1 that killed the former leader of the Pakistani Taliban, Hakimullah Mehsud, a day before the Pakistani government said it was going to invite him to hold peace talks. Khan pushed the Pakistani government to block NATO supplies after the strike on Mehsud, but it has shown little interest in doing so. Nawaz Sharif, Pakistan’s prime minister, has been a vocal critic of drone strikes, but he has also said he values the country’s relationship with the US. Sharif pushed US President Barack Obama to end drone strikes in a visit to Washington in October, but the US government has shown no indication that it intends to stop using a tool that it sees as vital to battling al-Qaeda and the Taliban.